Flying to Salvador meant a return to my schedule, but the real start to my solo travels. I had two nights booked at a hostel in beachside Barra with my flight to Manaus providing a framework for my stay. After a hot bus journey from the airport, following my progress on GPS, I spoke at great length with the helpful receptionist at Hostel Brasil. She recommended proceeding with my idea to squeeze in a visit to ‘Chapada Diamantina’, an area of natural beauty 6 hours inland. We researched bus times and I decided on an ambitious two day visit, travelling overnight in both directions to return just in time for my flight from Salvador’s airport. Satisfied with my research, I took a wander along Barra’s promenade to Santo Antônio Fort to see one of many beautiful sunsets, taking photos of the fan-fest screen and the block letters of Salvador. As I tucked into dinner, I reflected on feeling at peace with my free traveller’s lifestyle (inspired by the sunset of another destination) contrasted with the fear of loneliness on my path ahead. After missing several games in the second round and following a two day gap in fixtures, I was really excited about the day’s quarter final ties. I woke up early for breakfast which was a communal affair. Everyone swapped World Cup experiences and travel plans over the usual fruit, ham and cheese rolls with juice or coffee. I followed two Canadian guys to a nearby laundry service, one of whom negotiated in Portuguese for the price and collection time. Next was a trip to the historic centre of Salvador, so I found myself waiting anxiously for a bus labelled ‘Praça da Sé’ at the bus stop. Only my third local bus journey in Brazil, I came to realise that there are no timetables, route-maps or bus numbers. When you manage to spot your destination’s label on the front of the bus, flag it down and do not hesitate on which door to climb aboard. Sure enough, my bus drove away and I attempted to fade into the background to hide my ‘gringo’ shame! When the next bus eventually came I closely followed other passengers aboard. “Why the door confusion?” – I hear you ask. While all buses carry a driver and conductor, the position of their cash-desk and turnstile varies between the front and back of the bus, seemingly at complete random! I spent an hour wandering through the maze of cobbled streets of the ‘Pelo’, past colonial architecture and baroque churches. It was nice to soak up the World Cup atmosphere with Brazil’s colours ticker-taped all over the squares and across the narrow lanes. Its religious and African culture was apparent by the sounds of powerful drum beats beginning to fill the air and with women wearing traditional Baihian dresses. I fell into the tourist trap of allowing my wrist to be garnished with bracelets, but for a small fee I bought Brazilian and Dutch bracelets. Adorned with beads and lucky bracelets! I had a brief look inside the ‘Igreja da Ordem Teceira de São Francisco’ with its carved sandstone facade, discovering a peculiar indoor morgue-like mausoleum and understanding the stations of the cross in French. On the bus back to Barra I met a Peruvian man also heading to the fan-fest and he accompanied me first back to my hostel, where we acquired more company in the form of an Englishman named Rowan. The three of us decided on a quick take-away burger at a restaurant inside the security restrictions of the FIFA fan-fest. Top Tip: Quick is not however in the vocabulary of Brazilian restaurant staff, so we watched the start of Germany’s clash with France on screens outside. Another tip for you: if a burger states ham, egg and salad- do not assume it contains the standard beef patty as well! We heard Germany’s opening goal before we saw it with a severe picture delay and so moved swiftly into the main fan-fest viewing area. I will take this opportunity to rant further on FIFA’s selfish monopoly on what should be the local people’s chance to earn back their country’s investment to host the World Cup. As inside the stadiums, the fan-fests are restricted to official vendors for drinks (probably keeping the vast chunk of all profits) with locals limited to selling merchandise and drinks outside the security controlled area, through which you cannot bring any drinks. FIFA fair play?? Chatting football: Germany 4 – 2 England…wait that seems backwards!! 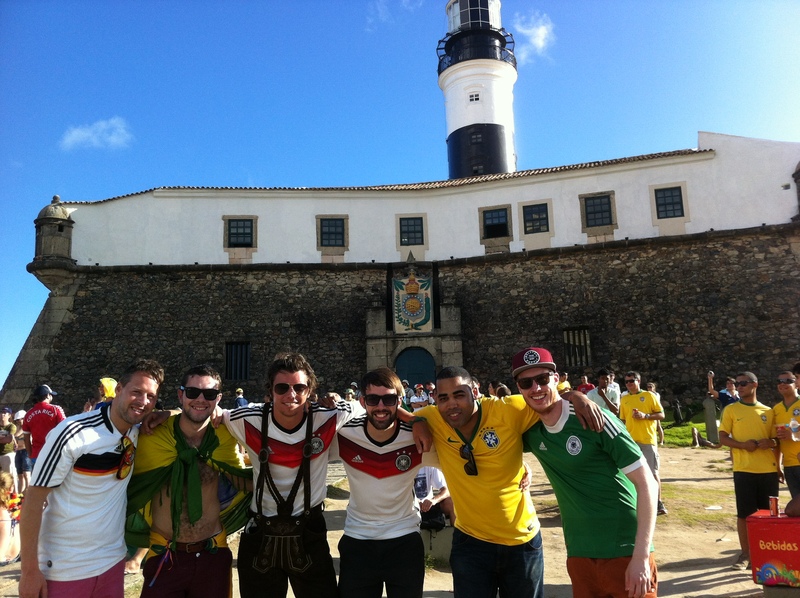 Once Germany completed their victory over France, we found ourselves talking with a group of Germans to pass the two hours before Brazil’s game against Columbia. I got into the spirit once again by painting Brazil’s colours on my cheek and keeping my faith in Fred on the other. I actually came across Fred’s only other fans after the match, when two young Brazilian girls asked for a photo with me. She assured me that she was not in fact joking, while the rest of Brazil continue to boo their #9. Keeping the faith in Fred! With a packed crowd, I had to wait until half-time to acquire beers. One poor lady had to endure shouting Brazilians waving money at her from all directions. It reminded me of film clips of crowds betting on an illegal animal fight. I upheld my English decorum and sure enough she ran out beers as I waited patiently! I tracked down some beers and pushed my way back through the masses to find Rowan – or a Brazilian guy I thought was Rowan! His confusion turned to laughter as Rowan turned round from the row in front to berate me for my stupidity. The game went well for Brazil to begin, taking a two goal lead. But things grew tense late on with World Cup top-scorer James Rodriguez pulling one back from the spot and Columbia were unlucky not to equalise. There was further unease for the Brazilian crowd as they lost Neymar to a nasty back injury. We got attached to a group of English fans who antagonised the surrounding Brazilians first with England chants and then more provocatively by celebrating Colombia’s goal. Things passed with Brazil holding onto their lead but leaving the fan-fest was not without drama as the crowd had to pass through a bottle-neck to exit. Some girls became quite distressed in the crush of bodies and I became separated from Rowan, with police making some arrests as well. A group of people collected back at the hostel before heading out for the night to the beachfront, once again finding the main party to be on the streets. Music and samba provided the entertainment with drinking serving merely as an accompaniment, reversing Western culture where drinking is the focus of nightlife. The entertainment was short-lived, interrupted by a heavy downpour but we continued the festivities back at the hostel. I joined the three Canadians in making caipiroskas, but my tiredness eventually overcame me and I fell asleep in all too typical fashion! After a lazy morning recovering from another Brazil matchday, I emerged to the common area to hear the common advice being repeated to another Canadian guy: “Be careful in Pelourinho. Only take what you need: just enough cash, no credit cards, keep all valuables in your front pockets, be vigilant in crowds, don’t dawdle taking photos, etc. etc. The Lonely Planet guidebook even states: “If you’re going to be pickpocketed or mugged in Brazil, Salvador is likely to be the place”! As the conversation progressed, I learned that this new group of Canadians had tickets for sale to Salvador’s quarter final that afternoon: Holland v Costa Rica. They were selling them at face value, a mere US$330 (around £200). Not cheap I know, but this was my last opportunity to see a live World Cup game this tournament and hopefully a first World Cup goal! I persuaded Rowan to join me and went straight to the bank for the mazimum R$1,000 withdrawal. With tickets purchased, laundry collected and check-out completed, business was taken care of and we went for lunch to watch the Argentina v Belgium match. 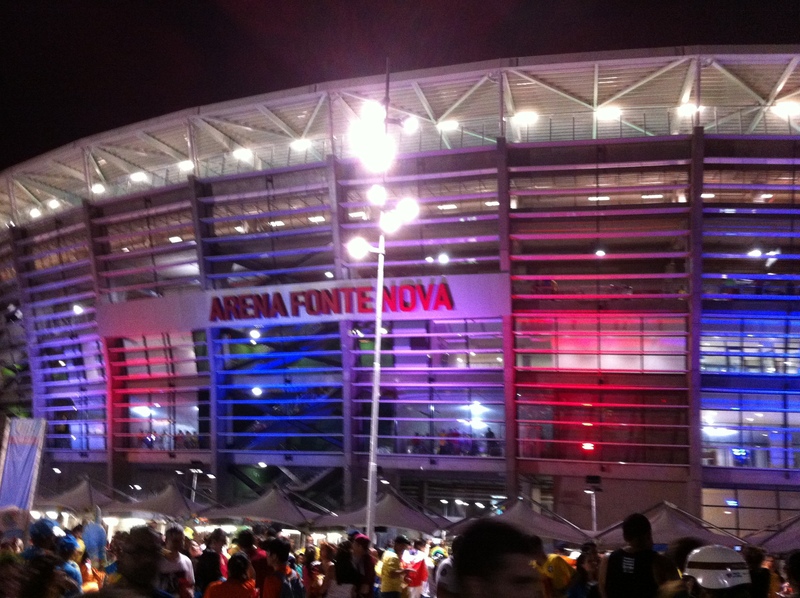 At half-time we tried to rush into the Pelourinho, but road closures ahead of the evening game halted our progress. We watched the start of the 2nd half on the taxi’s mini screen but we decided to complete our journey on foot. En route, we passed the Dutch contingent parading their orange attire and pushing the fan bus up the hill! we squeezed into a café for the game’s conclusion then wandered the streets of the ‘Pelo’ looking for remnants of any pre-match festivities. Inevitably any party had left with the Dutch fans so we followed the stream of fans heading towards the stadium, chaperoned by police (maintaining their presence as in the tourist-packed old town) as we skirted a small favela neighbourhood. Dressed for the occasion entirely in orange, I felt it necessary to show further Dutch support with some facepaint! We navigated our way around the complicated spaghetti junction of closed roads, through security checkpoints and ticket queues, before finally clambering to our lofty seats in the second last row of the top tier. On this occasion I had the luxury of watching the entire build-up, from the warm-ups through to the national anthems. The 90 minutes and first period of extra time was fairly disappointing, witnessing another defensive Costa Rica performance as the Dutch failed to create any significant chances. Aside from the persistent attempts at starting a Mexican Wave, the atmosphere in the crowd was disappointing too with no concentration of either Dutch or Costa Rican supporters in my vicinity. There were also empty seats throughout the ground, which was sad to see in a World Cup quarter final. The Brazilians ignorantly booed the Dutch possession (while Costa Rica sat back) and also booed the most exciting player on the pitch (even though Robben continues to be a diving cheat)! Some nearby Mexicans led the attack, having suffered to Robben and the Dutch’s fortunate comeback in the previous round. Fortunately the second period of extra time brought more excitement as both teams pressed for a winning goal. After a fruitless 120 minutes, I was at least guaranteed World Cup goals as the penalty shootout ensued. Van Gaal’s genius last minute goalkeeper substitution proved a vital mind-game as Tim Krul made 2 crucial saves, helping the Dutch to a 4-3 win. I seemed to be in the minority cheering on Holland but I celebrated a tense victory exuberantly nonetheless. With some time to spare, we stopped for some deliciously sweet caipirinhas in the main square of Pelourinho and then caught a taxi back to the hostel. I spent an anxious 30 minutes waiting for a bus before caving and opting for a taxi to the bus station. My bad luck with buses continued as to my horror I was told the bus to Lencois, gateway town to Chapada Diamantina, was fully booked. I persisted first at the ticket office then at the gate, using Google Translate to beg for merely a place on the aisle floor. But to no avail, I had missed my only worthwhile opportunity of visiting this destination having failed to learn my lesson about booking buses in advance. I was truly gutted and spent the journey seething in the back of another taxi. I made the ‘walk of shame’ back into the hostel, managing to check-in for three extra nights. People were sympathetic though and I rallied to have a fun night out in Rio Vermelho (squeezing five people into the back of a taxi heading there)! We met one of the hostel receptionists with two of her Brazilian friends, playing drinking games then sat drinking amongst a sea of plastic chairs in this lively night spot. Following an even lazier morning after two exhaustingly fun World Cup days, I could at least recharge instead of pursuing my hectic schedule if I had caught my overnight bus to Chapada Diamantina. A beach day slipped through our fingers, as our late lunch and diminished motivation got me and Rowan to Barra’s Praia do Pontal only in time for some late-afternoon sun. In fact, we both instantly fell asleep on the sand and awoke to find us covered by the shade of Barra’s towering beachfront buildings. We clambered up to the point overlooking the beach and caught another sunset out by Santa Antônio Fort, culminating in an outbreak of applause from the audience! I chatted to three Australian guys as we searched fruitlessly for a supermarket open on a Sunday evening. Instead we ventured to a Mexican restaurant nearby, continuing to trade travel stories. Most interesting for me was whetting my South American appetite with their exploits in Peru. As it was Rowan’s last night we wandered the quiet streets in search of another bar, returning to the point having failed in our objective. I was intrigued to hear a young Icelandic guy (speaking in a well-spoken English accent) talk about his studies in Chile. Determined not to waste my extra time in Salvador, I decided I was due a beach day to work on my tan. Recommendations pointed me North to Praia do Flamengo so I got my mind back to its feel-good mood with music and the passing beach scenery on the hour bus ride. Intermittent sunshine beamed down on me between thick clouds for the first hour, then my fortune faded. Picking up the early signs of rain, I made it to the shelter of a beach umbrella before the heavens opened! Now seemed the time to go for lunch, finding a seat at a recommended beach bar, Barraca do Loro. Here I received probably the slowest service imaginable, complimented by a shocking excuse for ‘escondidinho’, described as Brazil’s version of shepherd’s pie. It was a cheesy mess to put it simply! No more good could come of this cursed beach day and I headed back. The evening was uneventful aside from eating a tasty ‘Moqueca’ meal, a local seafood stew. Enjoying the beer and surfer statue at least! Without dwelling on mistakes and missed opportunities, it was plain to me that I should have booked my bus in advance. 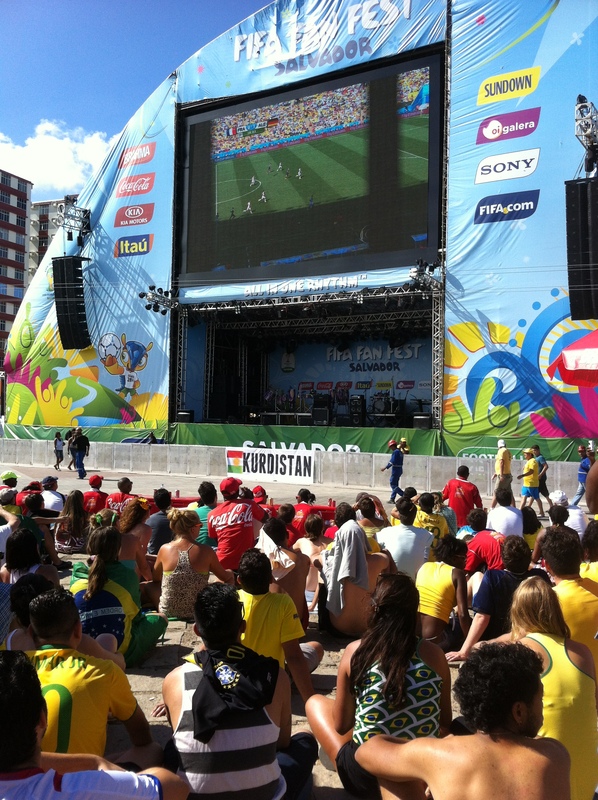 After two fantastic days of World Cup quarter finals, the two extra days in Salvador were doomed to failure. I must instead be glad as my bad luck could instead have resulted in a delayed bus returning from Lencois and missed my Manaus flight! So, lesson learnt and bad karma spent!